Doberman ears are naturally long and floppy much like a black and tan hound, from the very beginning Doberman ears were cropped very short so that if or when they were attacked by an intruder there would be no long floppy ear flap to hold on to and the Dobermann would be able to better perform his or her job of protecting their masters. One of the most difficult decisions for many Doberman owners today is the one relating to ear cropping. Cropping your Dobermans ears is a very personal choice and one that needs to be given serious thought. As a new Unique Doberman puppy owner you must be totally committed to spending considerable amounts of money and time for many months to come to get your puppies ears to stand. If you are going to show your Doberman in AKC conformation classes you should crop your puppy at 7-9 weeks of age. The ear cropping procedure should not be performed after nine weeks because the ear cartilage is already begging to "set" to lay flat and the blood vessels are becoming too large. Please do not try and crop your Doberman puppy after 12 weeks of age! Many vets prefer to wait as long as possible because of potential adverse reactions of a small puppy to anesthesia, however the longer you wait the longer you will tape and tape and tape, causing you and your puppy unnecessary and prolonged ear posting and wrapping. Many believe, and we are in this group, that cropped ears have less incidences of ear infections, ear mites etc. and are just much cleaner like the "wild dogs" naturally erect ears. Long floppy ears on any dog is a man made trait, they did not come this way originally. A veterinarian that is a ear cropping specialist will shorten and shape the ear so that it will be carried erect. It's extremely important that this ear cropping surgery has been performed by a competent ear cropping veterinarian so that the end result is in direct proportion to the dog's head and body, believe me this is a very artistic endeavor that your chosen vet must be fully able to successfully perform and care for during the posting process. Preoperative blood tests depend in part on the age and general health of the animal. Usually, most Doberman puppies are around 7 to 9 weeks of age and are healthy. Following anesthesia, the Doberman puppies ears are clipped and scrubbed with surgical soap to disinfect the area. An incision is made from the base of the ear, up the center and to the tip of the ear to remove the outer half of the ear. After the Surgery: The ears are kept taped onto styro-foam cups until the sutures heal, or if they are still with their litter-mates they are taped down across their head. Do not allow your Doberman puppies ears to fall down! The longer they are left down the longer they will take to get to stand up. If they are left too long, they may never stand correctly. One day is much too long. An hour or two at most is all you can wait. There is a great deal of controversy as to whether or not ear cropping is a humane practice. In the United States, the Association of Veterinarians for Animal Rights has recommended that the AKC and other breed associations delete mention of cropped ears from their breed standards. Currently as of this writing in 2019, the choice is still yours. Please get all the facts before making your decision. A lot of people prefer the unrecognizable "pet" look of an un-cropped Doberman and feel that it makes their dog appear friendlier and more approachable. You on the other hand may choose ear cropping to give him the breeds' standard traditional look. It is a personal decision unless you plan to show. Please make sure your veterinarian is competent in the latest ear crop techniques and current styles for your Doberman. Your Doberman puppy will need to fast for 4 hours before the surgery. Food and water can cause vomiting and aspiration (inhaling of vomit) once the puppy is sedated. This can be fatal. Withhold food after your puppies dinner the night before his surgery. Although the procedure does require the puppy to be anesthetized, it may lessen your fears about cropping to know that the entire operation takes only 30 min. and the puppy is under anesthesia only for that time. The very first thing your puppy will want to do after being cropped is eat, our veterinarian offers a small bite of high energy canned food when our Unique Doberman puppies wake up from ear cropping surgery. Average taping time is approximately 4-5 months, please be prepared for it to take considerably longer. Puppies will usually have their ears up by the age of 6 - 7 months. Please be totally committed if you decide to crop your Dobermans ears! Keep the ears dry. If the ears get wet, re-wrap them immediately with dry tape. If the ears fall as they probably will, you must put them right back up, just remember that for each day you allow them to be down you can add another week of tapping! Here is another Ear Taping Method, not what we do but some people like it. ABOUT AUTHOR: Dr. William V. Martin DVM introduced this method of Ear Posting to me. Dr. Bill (as he is commonly called) resides in Hendersonville, North Carolina, and though retired, still retains a practice for Ear Cropping and Corrective Ear Surgery primarily for Dobermans, Great Danes, and Pit Bull Terriers. He has clients come to him from all over the United States, and is considered by many to be the definitive “expert” in Corrective Ear Surgery. Although he uses a “Styrofoam cup” immediately after cropping young puppies, this method is used after the cups are removed and on any dog older than a young puppy until the Ears are standing. ABOUT METHOD: I have tried almost every method available on the Internet, tampons, sticks, and Quick Brace to list a few, but Dr. Bill’s Method is by far, the easiest, most economical, most effective and better for your dogs general health, than any of those I have tried. Simple to construct, from easily found materials, Dr. Bill’s posts are the lightest, most non-invasive form of Ear Posting, which both you and your puppy will soon come to appreciate. The general idea behind the Method is “simplicity and effectiveness” and the elements which make it successful are: STRENGTH: provided by the plastic straw; PROTECTION: provided by the Adhesive Tape; DOG FRIENDLY: by being very lightweight, the puppy does not have some bulky apparatus to lug around, the straw provides an airway to the Ear Canal, and the pup’s hearing is not impaired. There are some important things to remember, and I cannot emphasize these enough. First and foremost, you use a high quality Adhesive Tape. Believe me when I say, I have searched the planet for the “right” tape, and by using the correct tape you will find that the Posts stick better, and stay on much longer. Dr. Bill recommends KENDALL CURITY STANDARD POROUS TAPE. It can be found on the Internet at several Professional Medical Supply websites, or your own Vet may be a resource. This tape is very porous, which allows the ear to “breathe”, while supplying the “best” adhesion. Trust me, don’t scrimp in this department, the tape is probably the single important piece of the puzzle. The MCDONALD’S Large Drink Straw provides a lot of strength and support, while being lightweight, flexible, and allowing an “airway” to the bottom of the Ear Canal. I asked a Manager at McDonald’s for a few, and she gave me a thousand of them. Hope I never need that many! Gauze pads are easily found at every drugstore, and I suggest you get the generic “store” brand, as they are less expensive, and will be covered with tape anyway. All you need now is a good pair of scissors, and an assistant to help you hold your subject. Study the pictures carefully, as I have illustrated in detail, so you get both the materials and the concept correct. On a clean surface, fold out the 3x3 Gauze Pads in half, depending on the size of your puppy, you may need as many as three pads to achieve the correct size of the post. It should be big enough around to fit inside the ear. Lay out the straw in the center of the gauze pads, leaving about three quarters of one inch of gauze on one end. This is the part that will sit in the cradle of the ear, so it is important that the gauze extends the straw. Now put a piece of tape, about five inches long directly over the straw, this holds the straw in place as you prepare the post. Now roll the gauze and the straw into a tube. Starting at the bottom of the tube, begin wrapping the tape around the gauze making sure that you leave three quarters of a inch of exposed gauze on the end. This will be the “cushion” which sits in the bottom of the ear canal. As you reach the top of the gauze, twist the tape, so you can now "Back-Tape" the tube from top to bottom. “Back-Taping” is simply reversing the tape so that the “sticky” side is now out. When you reach the bottom of the tape on the tube, cut off the tape and secure the end to the post. For right now you should have a post that is very sticky and looks something like this, don't worry about the length of the straw; you will cut it to fit, later in the process. Obviously, you will have to repeat this step so that you will have a post for each ear, and then you will be ready to apply the post to your pup's ears. Having your assistant hold the puppy's head, take one of the posts and insert it down into the pup's ear. As always be very careful, but be sure to get the post all the way down into the ear. The soft gauze tip will sit in the bottom of the ear and protect it. Once the post is in place, gently wrap the ear around the post and begin taping as close to the base of the ear as you can get. Wrap the first piece, usually about five inches long, by first adhering it to the sticky part of the post, then wrapping in a clockwise manner around the bottom of the ear. This part requires a little bit of practice. It's important to have the tape tight enough to secure the ear, but not too tight to hinder circulation. The tape DOES NOT have to be tight, just stuck to the ear. Now wrap another five-inch piece of tape, in the same manner, around the top of the ear. Same rules apply in terms of tightness. Now simply repeat the process for the remaining ear. Now the “figure-eight” which holds the two ears together, and provides the stability for the Post. Take your tape and ”rip” a piece about one quarter inch wide, and about two feet long. I find that it is best to reserve a roll of tape specifically for this, as you can continue to “rip” strips from it. Starting at the bottom of either ear, stick one end of the strip to the tape on the pup's ear, and begin wrapping around both ears in a “figure-eight” motion. Have your assistant hold both ears up, and then “relax” them slightly, as this is the position that you want the ears to remain at after the post is applied. You will continue taping around both ears with the strip until you have reached the end. Now take a piece of tape, about two inches long, and wrap it around the “figure-eight” between the ears. This will prevent the tape from sticking to the puppy's head. Final step, cut the top of the straw, just above the top of the ear. This method provides a lightweight yet sturdy post for the Cropped Ears. When you notice the post is loosening or becomes wet, you can replace it easily. I have experienced great success with this method, and without messy liquid adhesives, bulky, protruding apparatus, and as little disruption to the puppy's normal activities. I have asked for and received Dr. Bill's permission to print these instructions, and make them available on the Internet to anyone that is interested. Many thanks to him and his staff for showing me a “better” way to post ears for my dogs. Questions and comments are always welcome. DO NOT ALLOW THE EARS TO BECOME WET, IF THEY DO CHANGE WRAPS IMMEDIATELY! Sophia Koster DVM is in central New Jersey, PA, NJ, NY, and Maryland too. 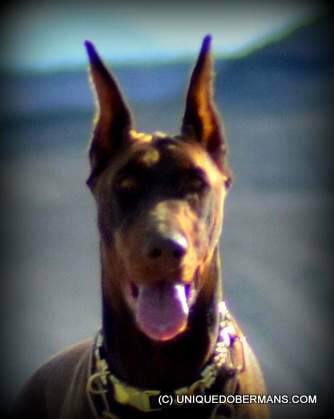 Home of truly protective and loving Guardian Dobermans! Our Powerful and Strong Doberman puppies for sale grow up to be protective guard dogs for private families. With their powerful jaws and speed they are the perfect security dog for large gated estates. Having been raised with kindness and love in a family home atmosphere they are well behaved and polite with our children and grandchildren.